Takayama is a compact city with a few different districts, each with its own character and attractions. 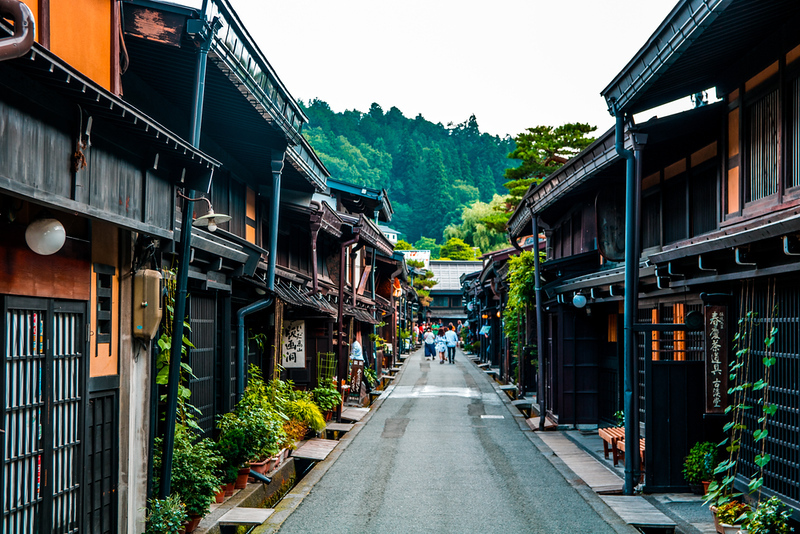 Here, I’ll introduce the main districts in Takayama and their top sights. Takayama Station Area: The train and bus stations are here, along with some big hotels and restaurants. Central Takayama: Between the station and the river, there are plenty of restaurants, shops and hotels/ryokan here. Sanmachi-suji Area: This preserved traditional part of town is the main sightseeing district. Sakaurayama-Hachimangu Area: The main shrine and the festival float exhibition hall are here. Around Takayama: There are several interesting towns within daytrip distance of the city. Takayama is a relatively compact city and most of the important sights are within walking distance of the station. For details on how to get around Takayama, see the Getting Around Takayama page. The Takayama Station area is the center of town in many ways. You’ll arrive here and you’ll find the main bus station and taxi stand here. You’ll also find many of the city’s hotels here. You can also find convenience stores, a post office, banks and plenty of restaurants. The Central Takayama area, which lies between the station and the Miya-gawa River, is the “downtown” of Takayama. There are several ryokan here, as well as many of the city’s shops, restaurants and bars. There’s also find the old city administrative center, Takayama Jinya. The Sanmachi-suji District is well-preserved traditional neighborhood on the far (east) side of the Miya-gawa River is the main sightseeing district of Takayama. The real attraction here is just strolling the narrow streets here and admiring the old houses. There’s also the temple-lined stroll called the Higashiyama Walkway. And there are plenty of restaurants and cafes here to keep you going. The Sakaurayama-Hachimangu area, in the north and northeast of the city, is home to several of Takayama’s most important sights, including two wonderful old Takayama houses, two museums and a fine Shinto shrine. A short bus or taxi ride west of the station brings you to Hida no Sato, a great collection of thatch-roof houses. Further afield, you’ll find the hiking center of Kamikochi, the thrilling Shinhotaka Ropeway (cable car), and the Unesco-listed thatch-roof village of Shirakawa-go.